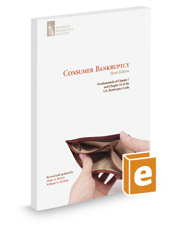 This revised book covers the fundamentals of consumer bankruptcy proceedings under chapters 7 and 13 of the Code, including updated information on the changes in the law since BAPCPA. In addition to providing the fundamentals of chapters 7 and 13, including debtor's duties, procedure, dischargeability, automatic stay, and much more, the Third Edition includes information on today's most litigated questions, including issues surrounding applicable commitment periods in chapter 13 plans, projected disposable income, case conversion, and exemptions. The revised book also analyzes several new U.S. Supreme Court decisions, including Lanning, Ransom, Espinosa, and Milavetz, and addresses the current state of consumer bankruptcy law. While it is ideal for the generalist practitioner, even experienced consumer bankruptcy professionals will benefit from the insights provided.